Jane Yolen is the author of approximately 16 million books. Oh, but I kid. She won't have written that many until next year. 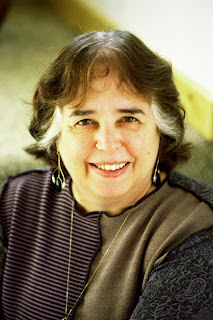 For now, her fans must satisfy themselves with her three-hundred some titles, which include the Caldecott-winning OWL MOON and the wildly popular DINOSAUR series, illustrated by Mark Teague, sitting next to Jane on stage. Jane's fans here are many--when Lin called her name, there was much whooping and clapping. Know that it takes a long time. Picture book people need to be dedicated. There is a particular kind of writing, illustrating and editing that is very demanding. There is also a great deal that you need to know. There are 10 key words we need to know: Lyricism, compression, child-centeredness, focus, hook, words, illustratability, motion, emotion, and resolution. I'll explain the thoughts behind the first three (keeping the rest for conference-attendees to savor). On lyricism: She's a fan of Maurice Sendak's line, "Let the wild rumpus begin." It's more lyrical than "Let the wild rumpus start," because that T in start is a final sound, which stops the action. On compression: In the last five words of WHERE THE WILD THINGS ARE, Sendak communicates a mother's love, the passage of time according to a child's perspective, and an entire emotional journey. 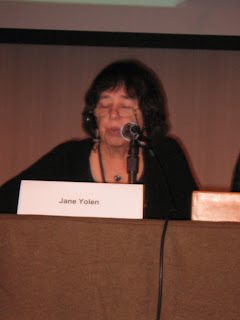 Jane Yolen shares secrets of writing great picture books.